Craniopharyngiomas are lesions which have provoked a lot of discussion as regards their origin and treatment. It has generally been accepted that the best chance of obtaining a cure is after total surgical excision. This goal has been attained in only a small number of patients because of the proximity and sometimes, dense attachment of the tumour to important neighbouring, neurovascular structures. Persistent attempts at a total excision in face of these problems has led to some fatalities, and many instances of severe post-operative morbidity. This led to the concept of a safe, subtotal excision, with postoperative radiation therapy to the tumour residue, with acceptable results. Excision of most craniopharyngiomas has been correctly carried out by the transcranial (mainly subfrontal and fronto-temporral) route. There have been a few reports of transsphenoidal excision. Since 1982, 51 patients with craniopharyngiomas, have been operated and of these, 11 patients have had their lesions excised by the trans-sphenoidal route. These form the basis of this communication. The trans-sphenoidal route for excision of pitutary tumours was first used by us in 1982. Over the ensuing six years, 140 transsphenoidal operations were performed for pituitary tumours and 11 patients with craniopharyngiomas were operated by the trans- sphenoidal route. Over the same period 40 patients with craniopharyngiomas underwent surgery by the trans-cranial route. After recording the clinical signs and symptoms skull X-rays and computed tomographic (CT) scans were done in all patients who underwent trans-sphenoidal surgery. Carotid angiography was carried out on the first two patients. Surgery: The trans-sphenoidal approach consisted of a sub- labial, rhinoseptal, transsphenoidal entry into the sella. The inferior part of the cartilaginous septum was excised in the first 9 patients. In the last 2 patients it was fractured at its junction with the perpendicular plate of the ethmoid, detached from its attachment to the nasal floor and dislocated to the right side. The bony septum was excised. An opening, as wide as possible was made in the sellar anterior wall and floor. If the lesion was obviously cystic (as judged by the CT scan), it was aspirated trans-durally. The dura was opened by a cruciate incision and as much as possible of the tumour and its capsule were excised. The sellar hole was plugged with either auto or homologous muscle graft, which was held in place with a bony stent from the nasal septum. The nostrils were packed with vaseline gauze and the sublabial incision was sutured. The extent of excision performed was graded as biopsy, sub-total excision and total excision. This was based on the operative impression alone. One patient had only a biopsy done as the tumour was very tough. During an earlier sub-frontal operation done at another insitute the prefixed position of the optic chiasm precluded any excision. Another patient underwent a trans-sphenoidal operation without even the benefit of a biopsy. This was due to the rock like calcification of the tumour. At the earlier sub-frontal operation, through the lamina terminalis the cystic part of the tumour was evacuated. Both these patients had had ventriculo-atrial shunts inserted to control the associated hydrocephalus. In one patient lesion could be totally excised. The tumour was predominantly cystic with little calcification within the capsule. In the remaining 8 patients only a subtotal excision could be performed. All these patients had large cystic components with small calcified components. Their cysts were evacuated and as much of the capsule as possible was excised. Only that part of the capsule that was densely adherent to the sellar walls was left behind. In some, the adherent calcified part of the tumour had to be left behind too. Radiation Therapy: External radiation with a Co60 beam was administered to all except the last 2 patients who have been operated only recently. Both these patients will receive radiation therapy as their excision have been sub-total. Each of the other patients received a total dose of 5000 rads. Even the patients in whom the operative impression was a total excision, was given radiation treatment. This was because the possibility of a small residue could not be entirely ruled out. Follow-up evaluation: This included one or more neurological examinations of 8 patients. The last 2 patients were operated only 5 and 20 days ago respectively. Follow-up in the earlier 9 patients has ranged from 6 months to 4 years. The second patient was seen 6 months after surgery, and has not responded to letters. The condition of one patient is known by a letter from the referring neurosurgeon. Three patients have had post-operative CT scans done after 3 years, 2 ½ years and 1 year respectively. Clinical Features: 9 of the 11 patients belonged to the second decade; 1 patient was 8 year old and 1 female patient was 45 year old. Eight were male patients and 3 were female patients. Headache, vomiting, visual disturbances and stunted growth were the common symptoms. Headache was present in 9, vomiting in 5, visual disturbances in 5, and 9 patients were stunted physically. Visual disturbances took the form of decreased visual acuity in 5 patients. Three patients had defects (bitemporal, right temporal, left superior temporal). One of these patients had a left superior temporal field loss without any impairment of acuity. Complete primary left optic atrophy was present in 1 patient, optic disc pallor was seen in 4 patients. Papilloedina was seen in 4 patients. Only 2 patients had a normal fundal appearance. The 45-year-old female patient had secondary amenorrhoea; the 15-year-old female patient never attained menarche, whereas the 10-year-old female patient was too young to do so. Investigations: The skull X-rays showed an enlarged pituitary fossa in 9 patients; 1 patient had only mild enlargement of the sella, whereas the remaining patient had a normal sized but demineralized sella. Purely intra-sellar calcification was seen in 3 patients, purely supra-sellar in 1 patient and a combination of intra -and supra- sellar calcification was seen in 2 patients. Angiography was carried out on only the first 2 patients, in one of whom it showed an avascular supra-sellar mass, and in the other it was normal. CT examination was carried out in all the patients. It showed an intra – and supra-sellar mass in 11 patients. The supra-sellar extension occupied the supra-sellar cistern in 8 patients and in 3 it extended upto the third ventricle. In 8 patients the lesion was predominantly cystic with specks of calcification within it. In 2 patients it was a combination of solid and cystic components and in 1 it was totally calcified. In 2 patients there was significant hydrocephalus due to compression of the third ventricle. Outcome: The last two patients who have been operated less than a month ago have had a sub-total excision and they will be subjected to radiation treatment. Their long-term outcome will be evident only later. There has been no mortality amongst these patients. The follow-up period ranges from 5 days to 4 years. Headache was ameliorated in 7 of the 8 patients in whom it was present. The eighth patient with headache has been operated only 5 days ago. Of the 5 patients who had preoperative visual problems, vision improved in 2, became worse in 2 and there was no change in 1 after surgery. One of the 2 patient’s vision deteriorated immediately post-operatively from a vision of 6/6 in the right eye to finger counting at 5 feet. The second patient had had a very poor tumour excision, and his vision deteriorated over a period of 1 year to near blindness. This was obviously due to unrelieved optic nerve compression. Of the 9 patients whose growth was stunted, 7 patients continue to remain stunted. The remaining 2 have been operated only recently. Two patients had already attained their secondary sexual characters by the time their lesions became symptomatic. Seven of the other 9 patients have not attained these characteristics yet. In the last 2 patients it is too early to judge the effect of surgery in this respect. Only 3 patients have had post-operative CT scans at the end of 4 years, 2 ½ years and 1 year respectively. One has no residue whereas the other two have shown small intrasellar tumour residues. Craniopharyngiomas can originate anywhere from the posterior pharynx to the third ventricle. The majority (50 to 85%) are supra-sellar or para-sellar in location. There is the smaller group which originates low around the pituitary stalk or even below the diaphragma sellae,. Depending on the type seen in large numbers, various surgeons have pointed out the merits of a particular surgical approach,,,,,,,. A general opinion has emerged that the best results in the treatment of craniopharyngiomas are achieved with a complete or at least radical excision whenever possible. Whenever a residue is left behind radiation therapy is resorted to with good results,,,,,,,. Unresectable cystic craniopharyngioma has been managed by aspiration through an Ommaya reservoir. Baskin and Wilson reported 74 cases of craniopharyngioma. They adopted various approaches like the sub-frontal (in front of the chiasm or through the lamina terminalis), an approach between the carotid artery and optic nerve, sub-temporal, trans-callosal, suboccipital and the trans-spenoidal route. The choice was obviously dictated by the direction of the tumour growth. Out of our 51 patients, 11 were selected for treatment by the trans-sphenoidal route. Two of these patients had normal sized sellae. As mentioned earlier during the trans-sphenoidal operation the tumour in one patient was calcified and not even a small bit could be excised, and in the second patient the lesion was very firm and it could only be biopsied. In the remaining 9 patients a radical tumour removal was accomplished. All these patients had large cystic components with small solid parts with calcified areas. The sella was enlarged in all these 9 patients. Due to a combination of favourable circumstances a radical excision could be achieved in all these 9 patients. In one of them the tumour was excised totally, whereas in the remainder a subtotal excision was possible. Nine of the 11 patients have had radiation therapy, whereas the last two who have been operated only recently, are undergoing this therapy. Admittedly the period of follow-up is too short to talk about cures, but in 7 of the 9 patients (excluding the recently operated two patients) a good excision has been obtained. In two others the excision has been totally unsatisfactory. This was due to the very tough consistency of the masses and only a little enlargement of the sella. One of them has been lost to follow up 6 months after surgery. In one patient on whom a sub-total excision was carried out, the vision inexplicably deteriorated post-operatively. In the remaining patients there has been no morbidity related to surgery and there has been no mortality. Even the two patients who were operated recently did not show any immediate post-surgical morbidity. The ability to achieve a satisfactory tumour excision by the trans-sphenoidal route in 9 of the 11 cases proves that the approach is useful for a selected group of patients. This is supported by similar earlier observations by others,,,.,,,,. Successful resection of craniopharyngioma requires selecting the most efficacious approach on the basis of pre-operative neuroradiologic documentation of the precise position and extension of tumour with respect to the diaphragma sellae, third ventricle, optic nerves, chiasm, circle of Willis and parenchymal perforating branches derived therefrom . 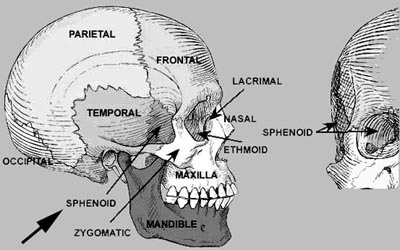 For judicious use of any surgical approach (including the trans-sphenoidal), a pre-operative determination of the location and spread of the craniopharyngioma is absolutely necessary. This is best determined by radiological means. Clinical examination helps a little towards this. On plain X-rays an enlarged sella points to a possibly subdiaphragmatic location of the tumour. This is easily corroborated by a CT scan. A direct coronal scan and sagittal reconstruction are a great help. These views directly determine the presence or absence of the lesion within the sella. A tumour with even a large midline superior extension is amenable to removal by this route. It being cystic (as many are) is a bonus! Even a soft solid tumour lends itself to a satisfactory removal. A firm or calcified tumour can usually be removed only partially. Increased vascularity compounds the adverse situation. Finally tumours with large parasellar, frontal or posterior extensions are not suitable for removal by the transsphenoidal route.